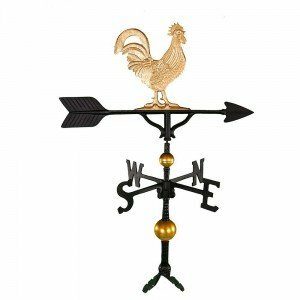 A rooster weather vane is one of the most popular weather or wind vanes and they are available in many sizes and price ranges. 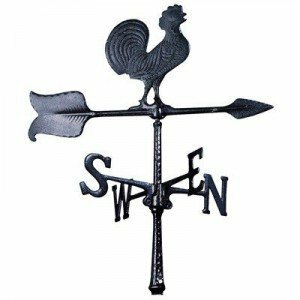 If you are looking for rooster weathervane reviews and where to find them for sale you came to the right place. 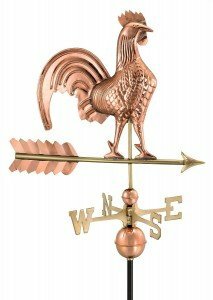 We have found the top 5 rooster weather vanes in several price ranges for you to pick from. All rooster weather vanes we have on this page received a 4 star or higher rating. We have to tell you that some of them were on sale at the time of our writing so we can not guarantee the the prices are still in the same price range when you read this. 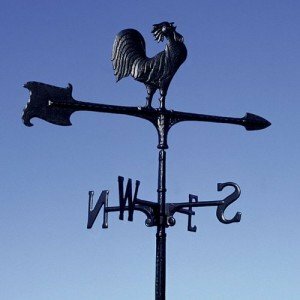 To provide all the information we have looked at small rooster weather vanes to the antique rooster wind vanes and grouped them in 4 price categories. Here is the top 5 rooster wind vanes with a 4 star or higher rating under $50. The adjustable foot will fit most roof pitches. This is a hand cast rooster made of recycled aluminum, and made in the USA. With 70 customer reviews and a overall rating of 4.4 out of 5 stars and a price way under $50 this can be a nice addition to any roof. size: 24 x 18 x 1 inch. Weight 2.8 pounds. Recommended for a cupola, garden shed, tool shed or small garage. It needs some assembling and it stated that it was pretty easy to put the 4 pieces together. Packed in a box with shrink wrapped cardboard. One reviewer mentioned he took it with him on a plane. This classic wind vane is a little bigger the the first one we looked at. 21 x 8 x 65 inches is a pretty size and that is why this one is recommended for a roof mount only. It is made of 14 gauge steel and has an antique copper finish. It will spin very easily because of the sealed ball bearing. That makes it in my opinion almost maintenance free and you do not have to re-grease it every year. The 12 inch mounting rod makes it easy to install. The manufacturer claims it has 3 coats. 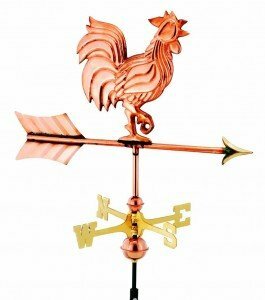 12 customer review and a rating of 4.9 is a very good score for this rooster windvane under $50. We have to say it was on sale on the day that we wrote this review and the normal price is between 50 and 100 dollar. 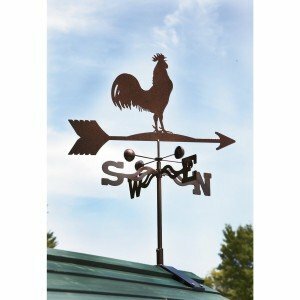 Made by a small business in the US this garden stake rooster wind vane has only 2 customer reviews, but both gave a 5 star rating. This products comes complete with everything you need. The quality is guaranteed because of the used 16 gauge steel and the powder coat baked finish layer. The stainless steel ball bearing should be good for an easy spin. What is a nice feature is of this product is that the top can be changed to an other wind vane. Again we have to say that this products was on sale and the normal price is little higher than $50. 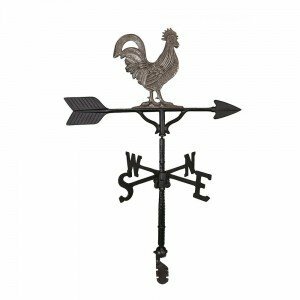 With a little lower rating, but still above our 4 star minimum this rooster wind vane from the Whitehall company is still considered a good deal. Made in America from Aluminum and it comes in the color black. The four legs makes it easy to fit any average roof pitch. The only question I have is that it is offered a 24 inch, but the specification mention it is only 22 inch when installed. This weather vane is not secured to the spike and like a customer form Texas wrote it can come of when the wind is to high. Maybe someone can come up with an easy solution and post it here in the comments. Only 8 customer reviews up to now, but overall people are pleased with this product. Although this picture looks like the one above it is an other rooster wind vane just smaller and not hand made. This one is 15 inch and is also powder coated and also has the Stainless steel ball bearing to ensure a smooth spinning in the wind. The windcups make this wind vane very easy to change with the wind directions. Although it seem to be a little small for a roof mounted wind vane, the customer review mentioned that it looks pretty good on a roof. It comes complete with the v-bracket to install on the roof. Only one complaint abut the ball bearing not being sealed good enough. Might be a defect and I would contact the manufacturer, who by the way got some great rating also. 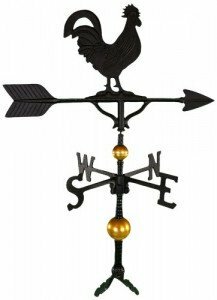 Here are the top 5 rooster wind vanes with a 4 star or higher rating between $50 and $100. Made in the USA and hand casted with recycled aluminum this rooster weathervane stands 32 inches high. With a 4.6 rating from 12 customers you can almost not go wrong with this one. There was one buyer who said that the fitting for the rooster on the main shaft was not good an he had to adjust it with a drinking straw. For the rest I can only find good reviews and a few mentioned that the gold color stands out real nice on the roof. A satin black base that is enameled holds this 32 inch golden rooster up high above your roof top. The golden accents on the base also gets a lot of good reviews. With the adjustable roof mount you will have no problem fitting most of the roof pitches. This product is made of hand cast recycled aluminum and is about 32 inches in size. Can be mounted on a cupola or roof top, but you might need different screws for each of them. Don’t know what to think of it but this was the description I found for this one. 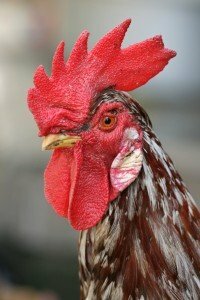 Was not aware that a Swedish rooster was different. It says hand rubbed and made from recycled aluminum. This means in my opinion that it is by hand rubbed in the mold like you can see in the video at the bottom of this page. The base itself is made from iron and has a satin black enameled coating. This weather vane is made in the US and measures 32 x 1x 23 inches. The base is adjustable and fits most roofs. One of the companies I found that makes weather vanes is the Whitehall company. 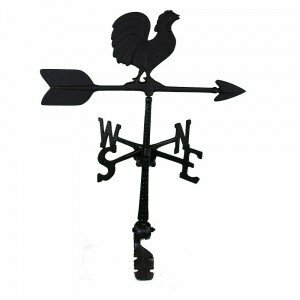 They are offering this almost classic rooster wind vane in our price range 50 – 100 dollar. Like most of them this one is also made of aluminum and it weighs 5.3 pound. Although this one is not designed to mount on a fence post I read that someone did it without any problem. The roof bracket is very adjustable and makes the installation very easy. 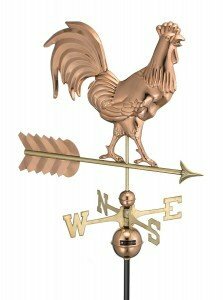 Here you can find our selection of rooster weathervanes ranging between 100 and 200 dollar. This wind vane from the good directions company comes in 2 versions. one is the polished copper and the other is the polished finished version that is a little higher in price. The roof mount is not included in the price and is sold separately. The look of this weather vane is like the historic ones we all know so well. Assembled the size is 25 x 40 18 inches. The rooster itself is 25 x 22 x 4 inches. This makes it big enough to be seen from a distance even on a higher roof. Although this one looks like the one above the rooster is a different shape and the arrow is also different. There are 3 versions available. The price difference is just a few dollar so you can decide what you like most in your yard or on your roof. 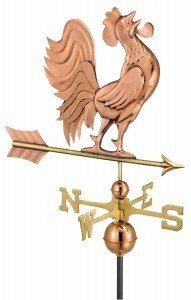 This weathervane by the Good Directions company comes in 2 versions also. They are both sold without the roof mount, that is sold separately. Assembled the size is 27 x 46 x 18 and just the rooster alone measures 27 x 28 x 4 inches. The package includes all-weather assembly rod, the copper spacer and the solid brass directionals that makes it spin easy. The single point contact of this design gives so little resistance that it will make the figure spin very easy. This is basically the same product as the one above it is just an other designed rooster. This one is based on the Smithsonian collection and hand crafted. Unfortunately this one does not come with the roof mount included again. The size of the assembled product is 27 x 40 x 18 inches and the rooster measures 27 x 22 x 3 inches. This is one of my personal favorites. 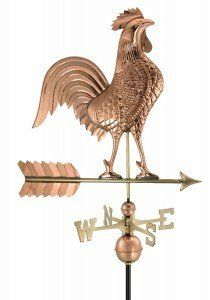 The copper finished crowing rooster wind vane will age beautiful over time. Like all other weather vanes of the Good Direction company it has the single point contact to eliminate friction and allow an easy spin in the wind. Assembled this one measures 25 x 39 x 18 inches and the rooster itself measures 25 x 21 x 2 inches. This makes it large enough to even place on a high roof top or Cupola. I think this is a very classical rooster figure for on any barn and will look great on a farm or any other estate. 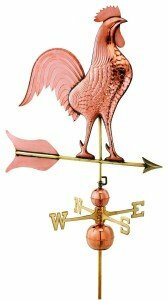 It is also one of the highest priced weather vanes I could find. What surprised me is that the roof mount is not included in the price, but has to be bought separate. The size is 38 x 61 x 23 assembled and the rooster just by itself measures 38 x 38 x 4 inches. The spinning is very easy because of the famous single point contact that will give very little resistance in the wind. Solid brass directionals will react even to the smallest wind direction changes and the copper space ball underneath it give this weather vane a very nice finish. This products is made of pure copper and this explains the higher price I guess. With its weight of 15 pounds you can tell this is a high quality product. In the 9th century pope Nicholas send out an decree that all churches should have a symbol of a rooster on their steeple or dome. this is a referral to the prophecy of Peter’s betrayal of Jesus that Peter would deny Jesus Three times before the rooster would crow in the morning. Other historians claim that the rooster was already found on the roofs or churches before the decreed of pope Nicholas. Fact is that pope Leopold already had a rooster installed on the old St Peter Basillica even before that time. There are a few other theory that stated that this custom had begun even 200 years earlier. The oldest wind vane in the shape of a rooster was made in the the year 820 an is now preserved in a museum in Lombardy in Italy. 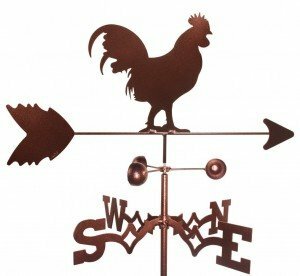 If you are looking for any other type of weathervane you can have a look at our main page about them by clicking on this link. It will take you to our Weather-vane review page.